The annual Descenders Monster Climb trip was set with great routes on the west side of the Sierras and another record number of riders. A total of 19 Descenders met at Casa Voris for the drive toward our first day of riding. Day 1 Crystal Lake-San Gabriel Mountains, 50 miles with 6,000 feet of climbing. Ranked #40th in CA, #1 for longest climb and greatest elevation gain in Southern CA. Looking fresh and ready for the Day 1 Ride to Crystal Lake from Azusa – Sheehan & Len already gone. The group cars drove to Veterans Freedom Park in Azusa. We all prepared for the ride up to Crystal Lake. Len and Sheehan took off early while the rest of us posed for a group photo before the ride. The group rode together past the Morris and San Gabriel Reservoirs as we started our climb. Within 45 minutes of the start of the ride Matt got a flat so Rick, Ernst and Bernie stayed back to help. Rob’s account: The group split more and more as we climbed up the 15 miles of curvy roads to Crystal Lake. Bob P and Guido were with me near the back with Cresap just ahead. The switchback roads allowed for us to see riders coming from the rear. Rick and Matt came roaring up and flew by us. Bob P took off and passed a number of riders on his way to the top. I rode mostly alone, passed Sheehan with a few miles to go and got to the Trading Post for a well-deserved rest. The group started to descend back down to the start. I wanted to pedal up to see the actual lake so rode a bit father, only to be disappointed that you have to walk down a path to get to the lake. I met up with most of the guys waiting for me at the main intersection. Rick, Oleg and Hodges went exploring farther up the main road, past the barrier. Oleg was scoping out a future Descenders climb all the way up to Wrightwood. I led out the group on the descent with Mike M on my wheel. We had a good-sized lead but eventually got swept up by Matt, Oleg, Voris and Ernst. The six of us sped along for more than 10 miles of great descending. We split near the bottom and Ernst did a huge pull to bring Mike and me back into the group. Oleg’s account: The group started thinning about 5 miles after passing East Fork – soon it was Peter Wood, Voris, Farkas and I, with Hodges chasing behind. Peter was feeling good and was pushing the pace – we caught Sheehan and soon Len – Len was able to hang with us for a while. Then Pete started really turning the screws on the pace – Len and Voris were smart enough to not participate but Farkas and I followed Pete. Soon I was forced to abandon the blistering pace, and backed off – Farkas was soon dropped from Pete’s wheel too. I was riding some 20 seconds behind Farkas all the way until the right turn to Crystal Lake, but about 2 miles before the turn I heard a loud “Swoosh” and Rick passed me, as if I was standing still. Next thing I knew he went by Farkas and disappeared out of sight immediately. He ended up catching and passing Pete before Crystal Lake cabins too – according to Strava (can’t hide!) from East Fork to Crystal Lake Rick was whole 9 minutes faster than Pete and 8 minutes faster than Matt Babb, who was climbing very fast after his flat, second best time for the day. We regrouped at the top, ate some sandwiches and had a few cokes and decided to head down. Several riders rode around trying to find the mysterious Crystal Lake, while Rick, Hodges and I explored the road closing – if we jump the gate and keep riding to Angeles Crest Hwy, the road takes us to Dawson Saddle on the longest continuous climb in continental US (over 7,000 ft! ), and makes it possible to connect to Wrightwood, roads we rode on our 2010 Tour of California trip. An epic climb to try some day, for sure! We descended into the headwind, forming a group of 6 riders, lead by fearless Descenders Matt and Ernst, and also including Voris, Rob, Mike McGowan and myself. It was fast and fun with a lot of fantastic views. Rob’s summary: Everyone changed at the cars into driving clothes and we headed north towards Kernville. The group got settled into the comfy Kernville Inn, started sampling the huge beer collection brought on the trip by Geoff B. The brew master did not disappoint as we drank great tasting beers on the porch outside our rooms. Guido had us all set for a good dinner at the Pizza Barn, a short walk from the hotel. Pizzas, beer and salads replenished our depleted stores and then we strolled back to the porch for more beers. Day 2: Shirley Meadows East and West, 60-95 miles with over 8,500 feet of climbing. Shirley Meadows East is ranked #7 in CA, #15 in US. Ranked as #1 most difficult 5-mile section in CA (9.6% average). Shirley Meadows West is ranked #56 in CA. Looking a bit scruffier after the Day 1 climb but ready to go for Day 2 – a huge day of climbing awaits. Rob’s account: After a good breakfast we prepared for our second day of riding. Oleg, Sheehan and I loaded up the support van and drove to the top of Shirley Meadow. It was a bit cool but the sun was out. The east side of the climb includes the most difficult five-mile stretch of climbing west of the Mississippi along multiple double-digit grade ramps. It is longer and almost as steep as l’Alp d’Huez and steeper and almost as long as the Tourmalet, two of the most famous and difficult climbs used regularly in the Tour de France. The group rode from the hotel south out of Kernville to Wofford Heights and made the turn west on Route 155 to start the climb. We rode down the wickedly steep road to meet up with the guys now heading up. Sheehan flew off into the distance while Oleg and I stayed under speed control to the bottom. Farkas and Pete were leading the group up the climb with Matt and Rick just behind them. The almost 7 mile ascent is very steep, averaging over 8% with some sections at 19%. The group spread out all along the climb, riding to the top and then turning to ride a few more miles to Alta Sierra ski area, the end of the road. We all rode back to the support car parked at the top and relaxed in the sun while eating and drinking. It was still cool and Hodges was searching for arm warmers and/or a jacket. He danced to “Boogie Shoes”, now a famous YouTube sensation. The group spread out along the descent towards Glenville. Guido, Sheehan and I cruised down together on the long descent of 15 miles regrouping at the Saddle Sore Saloon with Cresap, Len, Geoff and Bob P. Most of the other guys rode farther west to Woody, another 9 miles down the road with more heat and climbing ahead to return back up the climb. A small group consisting of Farkas, Rick, Pete and Matt, decided to venture towards Bakersfield. They saw some great open road and lots of miles of cycling. Our group that stopped in Glenville climbed back up Shirley Meadows West. I was exhausted and got blown off the back of the group; it was a slow solo ride back to the top to the car. We grabbed a bit more food and water and then rode once more to the very top at Alta Sierra. Guido and Bill camped at the support car while we descended down the east side of Shirley again towards Wofford Heights. We flew north back to Kernville at a blistering pace. We were the early group to finish our day, the pool and beers beckoned. We relaxed poolside waiting for the rest of the guys to return. The lost boys of Woody were nowhere to be found. Voris, Hodges, Ernst, Oleg, Jeff S, Bernie and Mike M all returned from the epic ride. Guido and Bill waited at the car for the “lost riders”. They all eventually returned but not before a few mechanical issues affected the ride. Farkas blew up his carbon wheel, Ernst had shredded his front brakes and Matt B blew a tire at the bottom of Route 155 in Wofford. Rick and Farkas rode a few more miles from the hotel to get in their 100-mile day. We all swam, enjoyed the beautiful afternoon and drank the rest of Geoff B’s great beers. Dinner Saturday evening was at another local restaurant, “That’s Italian”. Guido again had all the logistics coordinated well. We had a long group table in the back of the place and enjoyed good food and conversations about the days ride. Oleg’s account: Just a few things add to Rob’s write-up – what an epic day! A few mishaps – first Matt and Farkas get lost on the Shirley Meadows East Climb (what does RFB stand for, anyone?). Voris and I crested to the top of the climb and found poor confused Pete who was wondering where everyone disappeared. Back at the support car we had a lot of fun – including some of the most ummm, let’s just say “interesting” dance moves that I will unfortunately never be able to erase from my memory now (trust me, I tried!). chasing Bernie and Ernst at 30mph but miraculously managed to stay upright. But a quick tube change and I was riding with the rest of the boys back to Kernville. The mechanicals didn’t stop there – Matt also had a flat, Ernst melted his brakes and Farkas disintegrated his carbon wheels. Luckily, Guido saved the day with the support car. Despite 4 flats and two other serious mechanicals, nobody got hurt (except maybe for our eyes and memory brain cells during Hodges’ dance). And even though multiple riders got lost at two separate occasions, they eventually found their way back without any search and rescue operation. All’s well that ends well. Day 3 Sherman Pass Road, 40-60 miles with 5,700 feet of climbing. Ranked #8 in the USA, #4 in CA. Ranked #2 most difficult climb in CA 15 miles or longer (after Shirley Meadows). Rob: We packed up the cars after breakfast with Bob and Bernie and drove north to Johnny McNally’s restaurant. It was another picture postcard weather day-blue sky, no wind and cool temperatures in the high 60’s. Cresap, Sheehan and I took off first to get some lead on the group. Cresap motored fast the first 5 miles until we got to the turn to Sherman Pass Road. The west side of Sherman Pass is one of the toughest climbs in the country, ranked number 8 in the most difficult road bike climbs in the US. 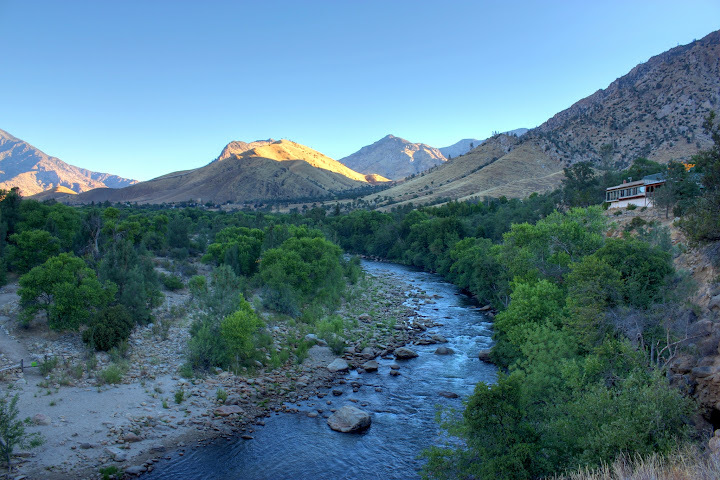 Isolated, beginning at the Kern River, the road immediately heads up the drainage at a steady grade. It is longer than and almost as steep as Mt Ventoux; perhaps the most difficult climb in France. We had 15 miles of climbing ahead with over 5,300 feet of elevation gain. Our pace slowed up the steep grade with Cresap heading off. I could see the other riders coming up the switchbacks. Bob P, Geoff and Len came by first, followed by Bernie, Mike M and Jeff S. We were spreading out along the mountain road. Pete blew by me so fast I could only get a photo of him heading off around the next curve. The views were spectacular. More guys passed me, Hodges then Farkas. Guido was sneaking up behind me while I took a few more photos. Eventually the train of Rick, Voris, Ernst, Oleg and Matt sped up from below. This was about halfway to the top. I continued on my slow climb to the top of Sherman Pass. The thickly forested roads were a treat to climb. The top was at 9,200 feet and offered great views of Mount Whitney to the east. Bob P had a great day climbing, reaching the top ahead of everyone except Pete. We regrouped, took a photo and began the descent back down Sherman Pass Road. The road was not quite as smooth and clean as Shirley Meadow but we had a fun time cruising back to the cars. Everyone made it back except Hodges who tried to pedal over to Kennedy Meadows before finally returning; he covered an extra 20 miles. A quick dip and bath in the very refreshing Kern River, a change of clothes and then a hamburger from Johnny McNally’s ensued before starting the drive back to San Diego. The return trip was quick and fairly uneventful except for one minor passing error on 395 just north of Adelanto. No harm – no foul, we all got home safely. Rob’s summary: The MC VI trip was a huge success. We rode over 150 miles and climbed over 20,000 feet; some added even more mileage and elevation. The weather was awesome, the roads were great to ride, the accommodations excellent, food good and great riding friends; an epic weekend to remember. This entry was posted in Monster Climbs TM and tagged glenville, kernville, monster climbs, monster climbs 2012, sherman grade, sherman pass, shirley meadows, shirley meadows east, woody. Bookmark the permalink.